Our statement on today’s ruling from the 5th Circuit that will shutter most abortion clinics in Texas. “Today our hearts are broken on behalf of the women and families in Texas that have been left behind by this 5th circuit ruling. This afternoon, the Fifth Circuit Court of Appeals ruled on the side of politics NOT women’s health. The courts left in place one of the most restrictive and harmful laws against women in the country. 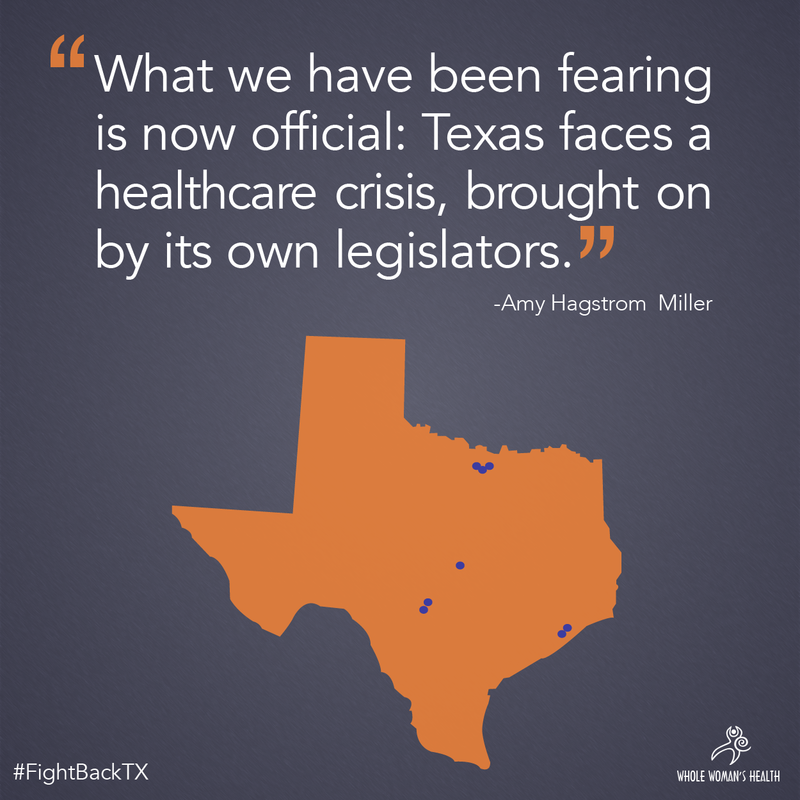 What we have been fearing is now official: Texas faces a health care crisis, brought on by its own legislators. Less than two weeks after reopening our McAllen clinic following an injunction by Judge Yeakel, we are once again forced to cease providing abortion care services to the women who need us most. We are forced to suspend provision of abortion care in our Fort Worth clinic as well, where we were the only clinic open in that city since the law went into effect last November. Politicians who were elected to ensure the safety and health of people in our state have turned their backs on the women and families who need us most. It’s bad enough that they are meddling in every woman’s decision about whether or not to become a parent, but it’s unconscionable that those who will bear the burden most are poor women and young women. Let me speak directly to the people of Texas: Politicians may have closed our clinics, but Whole Woman’s Health is here for you. We are committed to supporting women and families in our state. We are committed to providing abortion in a caring, holistic environment. We ask that you stand with us and stand united. Make no mistake—we are more determined, bolder, and stronger than ever. We will take whatever steps are necessary from here to preserve women’s access to safe abortion care in Texas. You have four more days left to register to vote. It’s time to fight back. One penny at a time, once donation at a time, one clinic at a time, one women’s rights advocate at a time, one male ally at a time, one law at a time, let’s PROTECT the RIGHTS of WOMEN to make their OWN CHOICES about their OWN BODIES!